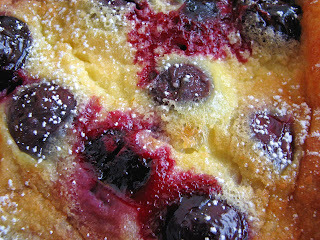 At this time of year among the French, clafoutis is a ritual. 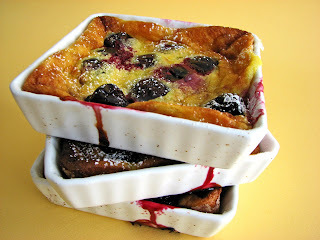 But for many Americans, clafoutis is considered an acquired taste. There are certainly quite a lot of ho-hum versions out there and if you don’t care for eggs, this probably isn’t the dish for you. Some versions of this simple cherry dessert are more like a sweet Yorkshire Pudding or a pancake and other versions are more custard-like. And there are many versions that are somewhere in between. 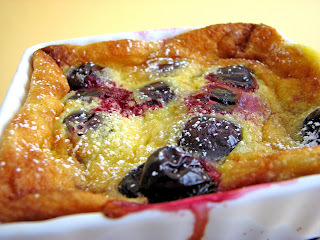 Clafoutis is a 19th century dessert that originated in the region of Limousin in central France. In the traditional version, cherries are left unpitted to impart more flavor, but American versions usually call for pitted cherries to avoid the heartbreak of dentistry. There are also many variations that call for other fruit, such as apricots, plums or pears. When other fruits are used, it is called a flognarde. Since it’s cherry season and I was headed to a French dinner, I decided to give clafoutis another go. To ensure its lusciousness, I’ve found that using an abundance of fruit is crucial so that the fruit juices permeate the flavor and texture of the pudding. I also think the only way to eat this is warm while it’s still loose. Some people like a garnish of vanilla ice cream, which certainly takes it to a whole new level. If you’re game, try your hand at your own variation and join us in praise of cherries. - I’ve added a pinch of salt, some acid and alcohol to the batter, which affect the process of coagulation and texture of the pudding and serve to tenderize it a bit. - Be sure your cherries are very ripe. You can even toss them with a bit of sugar and lemon juice and roast them in a 350 degree oven for about 15 minutes to bring out the flavor à la Chez Panisse. Drain off the juices, which can be reduced and used to garnish the baked dessert. - You can omit the alcohol and simply use the vanilla and add a 1/4 t of quality almond extract. You can add a pinch of cinnamon. You can even substitute some crème fraiche or plain yogurt for the milk. - I baked these individual servings for 25 minutes. Heat the oven to 375 degrees. Brush the baking dish with melted butter and dust thoroughly with sugar. Set remaining butter aside. Distribute the cherries evenly in the dish. Whisk the 1/2 C sugar, salt and the eggs together until frothy. Add the milk, cream and remaining melted butter and combine thoroughly. Add the lemon juice, vanilla and brandy or liqueur. Sift in the flour and stir just until well blended. Strain the batter into another bowl, zest the lemon and whisk. Pour over the cherries. Bake for about 45 - 50 minutes until brown and puffy. Cool for a few minutes. The clafoutis will deflate within a minute. Dust with confectioner’s sugar if desired. Serve warm. 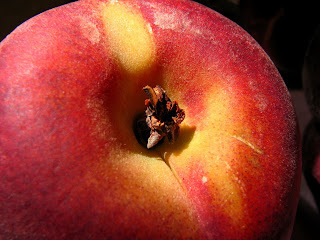 Peaches are showing their lovely glow in markets now. Who can resist? It’s still a bit early in the season, but you should be able to find some wonderful ripe fruit for all your favorite peach pastries and desserts. 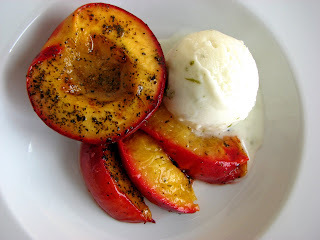 The very first post I made to this blog was a rhapsody to peaches, so you know I’m enraptured with them. They represent the deep hard-wiring I have about the sumptuous bounty of the natural world. Eat a peach and all is right. The lusciousness of peaches is so great that I sometimes hesitate to do anything very complicated with them. 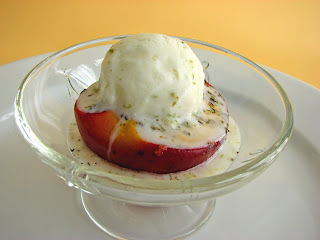 So here is one not-too-fussy recipe that tries to elevate the simple gorgeousness of the peach. I pair the fruit with a subtle but fabulous partner, a wonderfully fragrant jasmine tea blended with sugar. Jasmine tea comes from the Hunan Province and is the oldest known blossom-scented tea. It adds a light floral note. Baking brings out their combined lovely soft flavors and terrific juices. This subtle marriage is a happy one. I add a small dose of cool lime sorbet just to lift up the acidity a bit and add another creamy but not fatty layer to the union. If you love citrus, you’ll be crazy about this sorbet. It is absolutely delicious all by itself and would also pair well with lots of other fruit. It takes no time at all to prepare. The reward is ginormous. - Use the best, most fragrant jasmine tea you can find. - You can make the sorbet base ahead and refrigerate it for a day before churning. 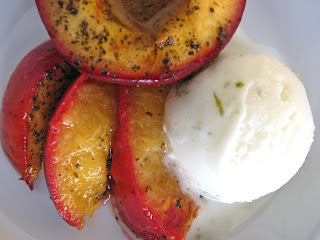 - This is best served when the peaches are still warm and the sorbet is just about melting. Whisk together the yogurt, lime juice, sugar and lime zest. Pour into a clean airtight container and refrigerate until the mixture is well chilled. Place in your ice cream maker and freeze. Store in your freezer for about an hour to firm up. Process the sugar with the tea until finely blended. Halve and pit the peaches and place in a baking dish. Spritz with lemon juice. Brush with melted butter. Sprinkle with jasmine sugar. Bake for about 20 minutes or until the peaches are tender and juicy. Plate and serve while still warm. Add a scoop of Lime Sorbet. Devour. It’s strawberry time! Strawberries are aplenty right now. Lucky for us, what lies ahead is a long and playful season of shortcakes and pies and coolers and compotes. In addition to these traditional treats, I thought I would try something a little bit off the beaten track. Meringues are so simple and airy and light. Add a little black pepper and they become these intriguing sweet-spicy-warm crunchy cases for a handful of strawberries that have been tossed with a bit of sugar and Grand Marnier. Biting into one of these fills your mouth with a lot of different sensations – crunchy sweet blasting into a million shards, fresh luscious strawberries with a bright citrus acidity and warm sweet spice finishing with a bit of heat. Hard to put your finger on it, so it requires another bite. And then another. And you keep going until you figure it out. 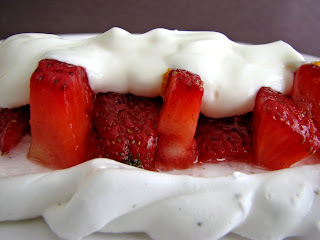 This dessert is an unusual and fun combination that also provides a great ending to a light summer meal. Yes, it's just about summertime. Where the living is easy. - For the meringue, use freshly ground pepper. If you have very pungent peppercorns, use a heaping 1/4 teaspoon. If you like the fiery taste of spice and heat, add a smidgen more. - If you enjoy using a pastry bag, it’s fun to create lovely shapes with your favorite tip. If not, simply plop the meringue with a spoon or use a small offset spatula to spread it out into whatever shape you desire. Just make sure that the bottom isn’t too thick so it dries out properly. - Once they were baked, I shut my gas oven off and left them in the oven overnight. For longer term, store them in an airtight container to avoid any humidity. If you stack them, separate them with parchment paper. - Play with the strawberries according to your own taste. I added sugar, Grand Marnier and orange zest, but if you have a better idea about what would go well with black pepper, go for it and let me know! Lavender sugar might work or a splash of quality balsamic. 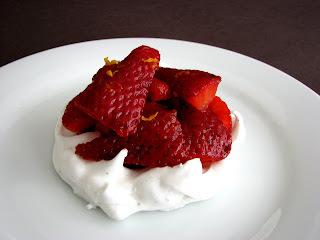 - Garnish with a bit of sweetened whipped cream if you like, flavored with orange liqueur, an herbed simple syrup or a pinch of caramel. Preheat oven to 150 degrees. Trace circle, rectangle or square shapes of whatever size you wish on a piece of parchment paper using a dark pencil. Place parchment pencil side down on a baking sheet. Place the egg whites in the bowl of an electric mixer and whisk on medium low speed. Add cream of tartar when they are foamy. Increase speed to medium and continue whipping until they are opaque and form a very soft peak. Increase speed to medium high and slowly drizzle sugar a couple of tablespoons at a time. 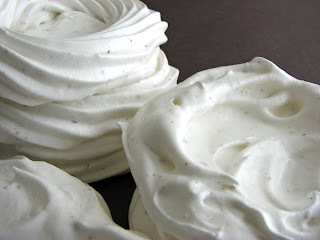 Continue whipping until meringue forms stiff shiny peaks that hold their shape. Drop meringue by spoonfuls or pipe onto the parchment-lined baking sheet. Place in the oven and bake for about 2 hours or until meringue easily releases from the parchment and feels dry to the touch. Turn off the oven, leaving the oven door closed, and continue to let meringue dry. Hull and slice the strawberries. Add sugar to taste and a shake of Grand Marnier. Add the orange zest and let the berries sit for a few minutes to allow the flavors to bloom and the berries to macerate just a bit. 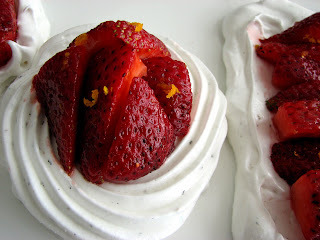 Arrange berries in your meringue vessels and serve immediately. Cherries are among us! These bright shiny jewels with their long green stems are bursting with sweet colorful juice. Ah yes, Spring has truly arrived. There is a wonderful Cherry Sauce from Charlie Trotter seared in my memory. It combines some lovely flavors in perfect proportion and of course it pairs perfectly with chocolate and vanilla. So here is my idea for an open faced ice cream sandwich that I think is the most delicious way to experience the genre. 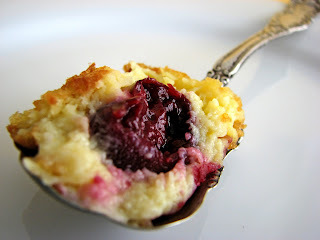 The Cherry Sauce is a tart-sweet concoction with a nice mystique of spice and a delicate back note of wine. The not-too-sweet chocolate cookie showcases a deep cocoa flavor and crisp texture that complements the fruity sauce and the lusciousness of fresh vanilla ice cream. 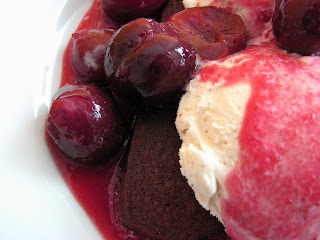 Put this trio together if you find yourself with a packet of fresh cherries on your table. Its magic will keep you spellbound well beyond the last bite. 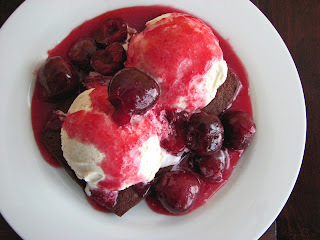 - The recipe for this Cherry Sauce calls for Sauternes, but a white Muscat, Beaumes de Venise, Sémillon or Monbazillac would be good substitutes. Be careful not to confuse Sauternes, a sweet French dessert wine, with Sauterne, a dry wine made in the United States. 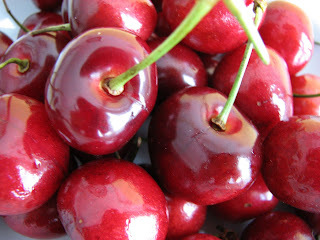 - If your cherries are not at all sweet, add 1 T of sugar to the sauce ingredients. - The Chocolate Cookies are a wonderful version of the standard that take their primary flavor from cocoa, so use a quality brand if you can. The recipe makes about 40 2” cookies. For this plating, I rolled out four larger rectangular shapes and formed one 2” log with the remaining cookie dough. Or simply serve this as a Sundae with a couple of cookies on the side. 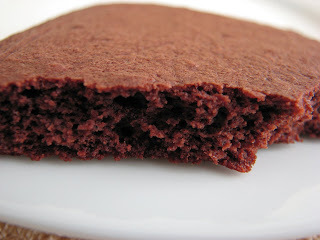 - It can be difficult to tell when chocolate cookies are done because they don’t brown, so watch them very closely. Bake just until the cookie moves easily when nudged. Baking too long will produce burnt edges and they will taste bitter. The cookies crisp up as they cool. - When making the base for the ice cream, watch it closely. If you use an instant read thermometer, cook it to about 165 degrees, then pull it off and keep stirring for just a moment. Residual heat will usually take it to 170, which is about right. But you have to watch it very, very closely because at that point the temperature rises very quickly. When it reaches 170 you have to pour it off immediately into the chilled cream. It's trashed at 180. - Preparation can be staged over 2 or 3 days. Prepare the ice cream base and mix the cookie dough on day 1. Spin the ice cream on day 2. Make the sauce and bake off the cookies. If you don’t have the time or inclination to make fresh vanilla ice cream, substitute a great artisan or quality brand. Bring liquids and spices to a slow boil over medium heat. Add the pitted cherries and slowly return to a boil. Remove cherries and reduce sauce by half. 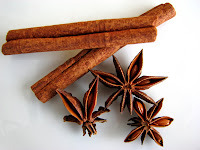 Remove the cinnamon sticks and star anise. Cool. Add half the cherries to the sauce reduction and puree. Strain and add remaining cherries to the sauce. Slice dough into 1/4” cookies and bake @ 350 degrees for 10 minutes or until the cookies move easily when nudged. Place the chilled heavy cream into a large bowl. Set aside. Combine the milk, sugar and salt in a medium saucepan. Split the vanilla bean and scrape the seeds into the milk mixture along with the bean pod. Heat slowly over low heat, until the sugar is dissolved and the milk is steaming a bit, stirring to fully combine. Remove from heat and strain into the heavy cream, whisking to mix and cool. Cover and chill thoroughly, preferably overnight. Freeze in your ice cream maker. Pour into a container and freeze to firm up.